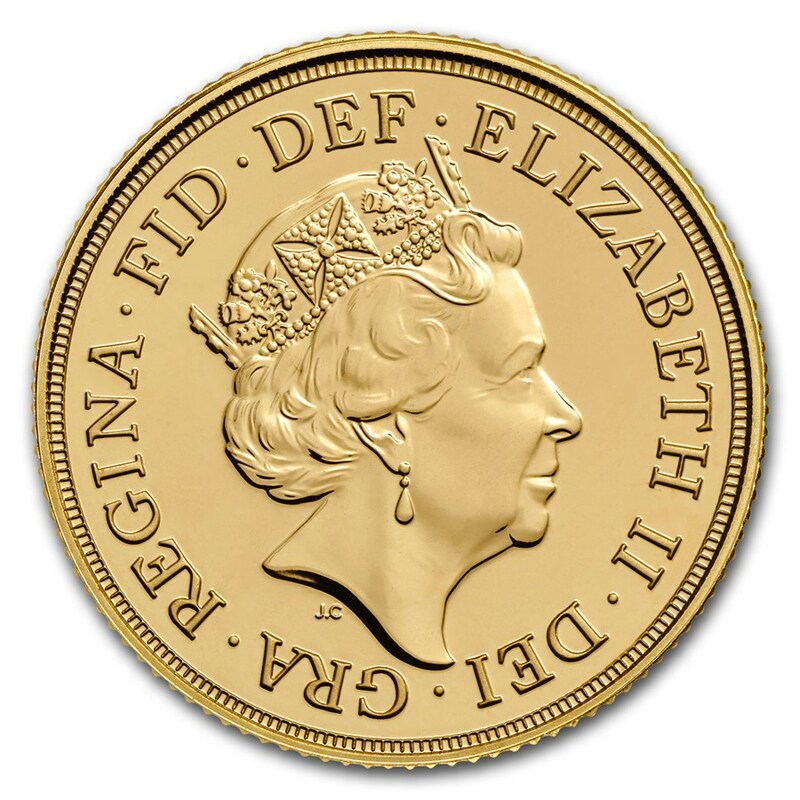 The British Gold Sovereign coins (0.2354 ounce) are among the most prestigious coins in the world. ‘The Sovereign’ is the British Royal mints classic. It has become a symbol for British coinage. The gold bullion Sovereign coin is one of the most recognizable gold coins in the world. First minted over 530 years ago, they hold an unquestionable amount of historic and patriotic value to Great Britain. These coins make an ideal investment, or perhaps a perfect addition to a collection. The coins highlight an elegant depiction of the fifth portrait of Her Majesty Queen Elizabeth II. The coins always depict the reigning Monarch at the time it was struck. This gold coin was designed by Jody Clark of the Royal Mint. Following tradition, the reverse side includes a rendition of St. George - mounted on a horse and slaying a dragon. This popular image was designed in 1817 by Benedetto Pistucci, an Italian engraver. The Latin word for ‘by the Grace of God, Queen’ is presented on the coin as well. Protect your gold Great Britain Sovereign Coin from fingerprints by using cotton gloves and handing your coins with care. You can also protect your coin by keeping it inside a clear plastic capsule. This will display the coin very elegantly, and also add extra value and presentation to your coins collection. 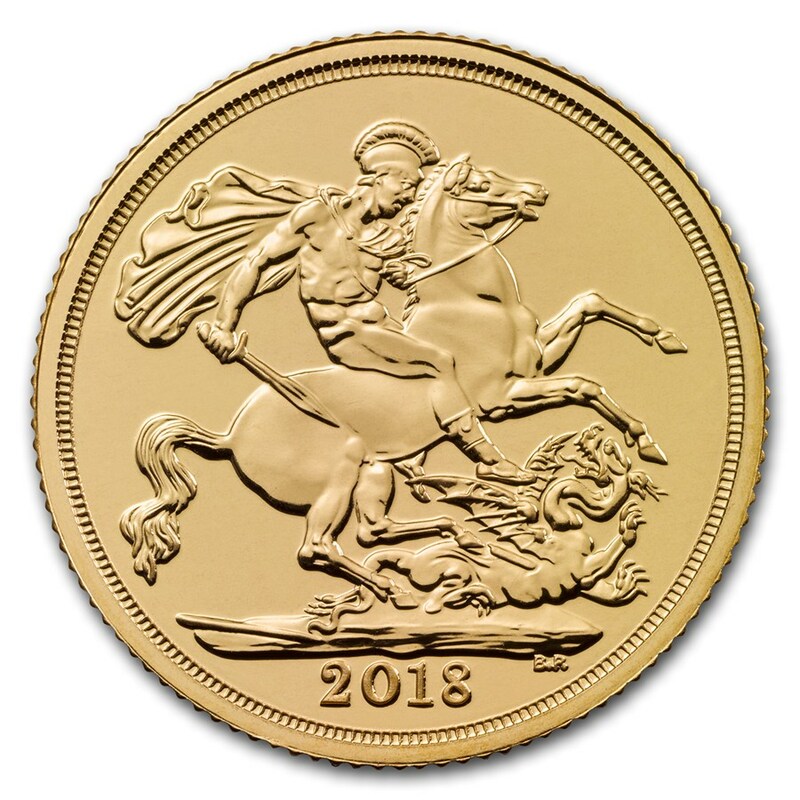 The Sovereign is the gold coin of the United Kingdom. It has the nominal value of one pound sterling. The production of this gold coin began in circa 1489, under the reign of King Henry VII. It continued to be minted until the reign of James 1, in 1603. The coin we know today originated as a part of the Great Recoinage of 1816. At first, the coin did not boast of significant popularity as the English public preferred notes over coins. Yet, as soon as the paper currency was limited by law and the coin started circulating, it became one of the most popular coins in England. This remains true to this day.